I had such high hopes of getting so much done at our Stamp Club Saturday meeting two weeks ago but I just didn't quite make it! 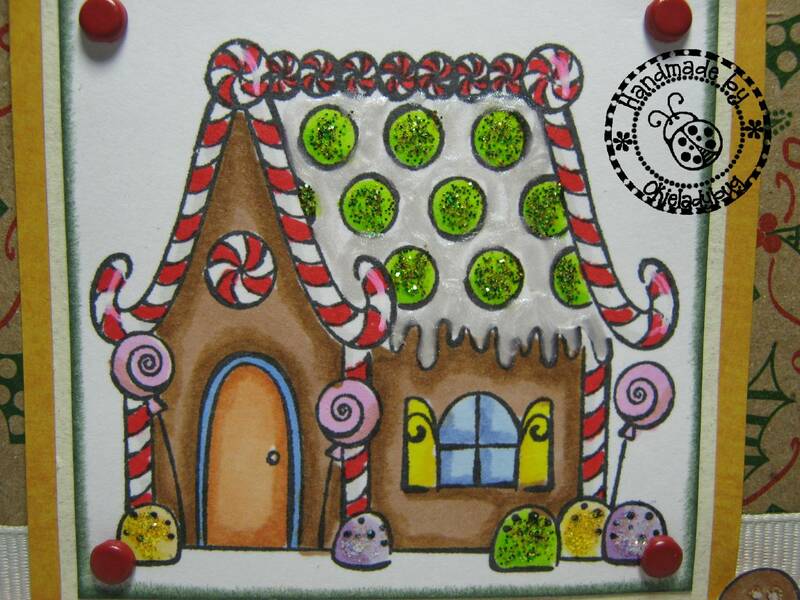 I colored these gingerbread houses and that was about all I got done! I didn't realize they were going to take so long. Of course I don't think it had anything to do with us eating and yakking the whole time *okie has innocent look on face*. I used ProMarkers to color the images. For the gingerbread I used 3 different colors of brown, and I can't find my little piece of paper where I wrote down the colors but I think they were Cinnamon, Burnt Sienna and Tan. 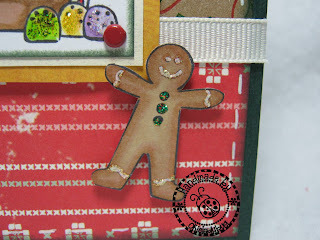 I did a bit of reverse coloring on the gingerbread, I started with the darker and then went in with the lighter browns. There really isn't a right or wrong way to do the layering of colors. I think it is all just personal preference. I do like how the cards turned out. The stamps were a set from Stampin Up and I think maybe the year on the set said 2005. If ya look on the roof you can see a pearl icing look to it. After the image was colored I used something similar to Liquid Pearls. It gave the roof a true look of icing! Okay go ahead and say it...OKIE YOU GENIUS YOU! *okie waits........waits....sighs and stops waiting*. 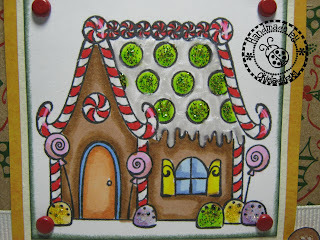 I used some Stickles on the candies on the roof and the gum drops along the bottom. If you click the picture you can see the details a little better. 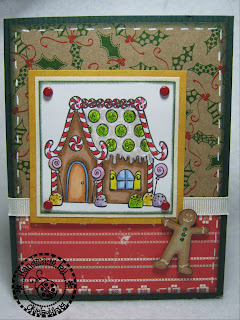 Oh yes, and on the candy canes on the roof I drew a slight line with a white gel pen to give it just a little highlight. There were some small candy images in the set and then this gingerbread man. I wanted him on the card because I thought he was cute! Cutting him out wasn't too bad. I used a white Signo gel pen for the white accents and then added Diamond Stickles. The buttons are with Holly Stickles, which are green with a hint of red mixed in. And yes he is pop dotted! I certainly hope you guys are going to be around next week because my evil twin Capadia and I will be doing a little giveaway! Okie- This is so cute! Love the stamp set. Merry Christmas to you and your family. That's one of my favorite sets from SU because I love gingerbread houses. You did a nice job with it & I love all the special touches, like the stickles & pop-dotting. Have a merry Christmas! 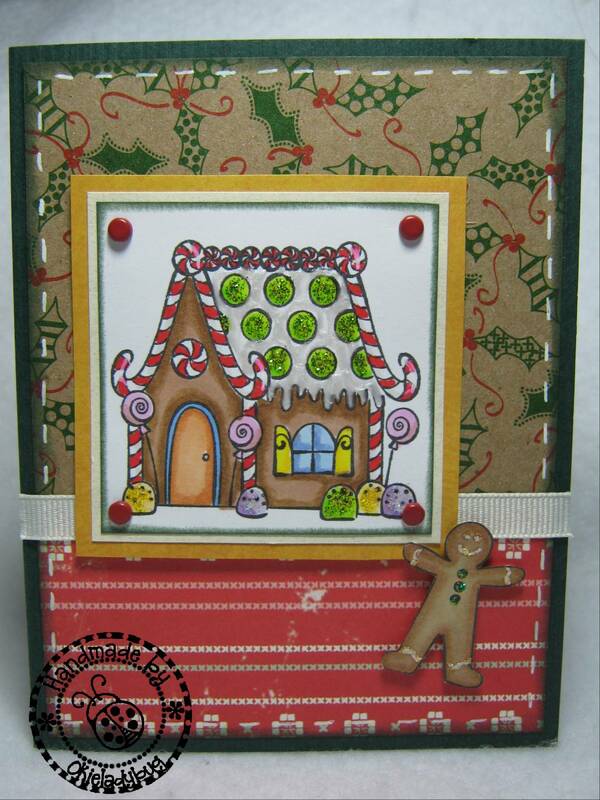 Great card ... your coloring skills add a WOW factor to this cutie ... love the vibrant colors too! Way too cute! The coloring job is great. Makes me want to eat some candy.